When initally advised by SA GERSZEWSKI of the purpose of the interview, MOTE indicated that he did not believe it was "in his best interest" to discuss the matter. MOTE further indicated that he should possibly have his attorney with him during the interview. After being reassured that he was not the subject of any ongoing investigation, MOTE reluctantly agreed to discuss the matter, "for a few minutes". After being shown the document, MOTE denied having provided it to ROOKSTOOL's father. MOTE went on to indicate that the document did not appear to be authentic, in that offense number listed was "just a jumble of numbers". He further indicated that the offense "Disturbing the Peace" was not an offense so designated under the Texas Criminal Statutes. MOTE suggested that the records of the City of Dallas Police Department be searched in order to verify the authenticity of the document. MOTE then indicated that he did not wish to discuss the matter any further. Early in November 1999, assassination critic Jack White announced he had come up with a piece of evidence supporting his contention that the Bledsoe document was not a hoax. The proof, he suggested, was in the form of an FBI report dated February 26, 1992. It and the text of the report are reproduced above. Unfortunately, it appears, as with the Bledsoe police report, we have another case of someone reacting before reviewing the facts. Mr. White's memo follows with my comments in bold blue. In February of 1994, John Armstrong discovered, and in March Jim Marrs and I publicized, the Bledsoe document. For this we were roundly castigated by the Perry-Aynesworth-Mack group. John had located a poor copy of the document in the Marguerite Oswald files at TCU. The trio was criticized by Gary Mack and Dave Perry. Dave Perry was the author of A CTKA Story, which was critical of the questionable claims and findings offered primarily by Mr. White. Hugh Aynesworth had nothing to do with the episode. I ask Mr. White to post his evidence that Aynesworth was involved. I find it curious White would consider issuing a press release when he considered the document in question a "poor copy." THAT WAS IN 1994. 1994. 1994. Actually the report shows an FBI employee, Farris Rookstool III, discovered the report among his father's papers. Rookstool, and not the FBI, made the DISCOVERY in 1992. He brought the item to the attention of the FBI. There is no notation as to when the document came into the possession of Rookstool's father. Additionally, there was no "investigation," as White claims. To the contrary, the report clearly states, ". . . he (Mote) was assured he was not the subject of any ongoing investigation . . ."
If Mr. White received a cold call from the FBI he might be inclined to wonder if he needed legal representation. Once Mote was advised there was no investigation, he DID discuss his interpretation of the document with the FBI Special Agent. What was the role of Mote in this mysterious matter? Why was the FBI investigating it 2 YEARS BEFORE IT WAS FOUND and publicized? I think these are pertinent questions. Yes, these are two pertinent questions. But the answers become clear if one bothers to read the report CAREFULLY. Of course, as stated above, the FBI was not conducting an investigation and Armstrong did not "find" the document. He merely rediscovered it. Note that Mote was an employee of Dallas County Courts. Did he find the document in County files? I spoke with Mr. Mote a few days ago. He was, and is, a BAILIFF employed by the Dallas County Courts. He has no memory of ever seeing the police report, doesn't know where it came from and doesn't know how his name came to be on it. However, he tried to be helpful by pointing out the more glaring errors to SA Gerszewski. White asks, "Did he find the document in County files?" READ THE REPORT! He didn't find the document! Farris Rookstool III found it. 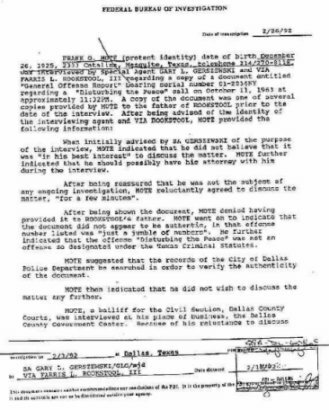 However, Mote did suggest that the FBI search the Dallas Police Department records! Meaningful analysis of this FBI document will be appreciated. No repetitive cries of "Hoax" please. The FBI report is not a hoax so there will be no "repetitive cries of 'Hoax'" from me. However, with respect to the Bledsoe document, it would appear the only true believer is Mr. White. The document has been dismissed by the late New Orleans District Attorney Jim Garrison, Garrison's staff, Gary Shaw, Mary Ferrell, B.W. Hargis, Frank Mote and the FBI, to name but a few. Mote is not, and has never been considered as, one of the hoaxers. The individuals involved are not "suspected." They have supplied me with proof positive that they created the document. One additional point ~ the people responsible are not guilty of any criminal wrongdoing. They prepared a report as a practical joke to be played on Mark Lane. When that fell through, they sent it to Penn Jones, Jr. Since the people involved never provided any police authority with a copy, no offense was committed.